Our Mission Statement: To advise and serve our clients at the highest attainable level and to maximize our clients' financial, social and familial benefit of real estate ownership. 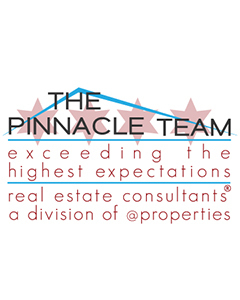 The Pinnacle Team offers each client the highest level of professional service in buying and selling property. With over 25 years combined sales and sales management experience, The Pinnacle Team knows how to change and adapt to different markets. The Pinnacle Team represents both sellers and buyers with their specific goals and needs in mind and work hard for their clients 7 days a week. The Pinnacle Team was founded in 2007 with a goal of giving each client full attention. If one team member is unable to help you, an equally talented professional will step in to offer the service you need. They share information about the most current market trends and news where it matters most “ in the neighborhoods. Real estate is a local business. The Pinnacle Team knows local market conditions, and they will educate you so you understand all the factors affecting your decisions. Client Committment: Our team believes that all reasonable showing requests must be accommodated and lock-boxes should only be used for emergencies. It's their face-to-face approach, along with top-notch marketing, that helps to shorten market times on their listings. Time matters as much as location. The Pinnacle Team will be there when you need them. They know how to adapt their approach to fit your goals and current market conditions. Whether you are a seasoned investor or a first-time buyer, they deliver resources and knowledge that will make your difficult decisions a little easier. The Pinnacle Team is there with you even after a sale, advising you on the value of your investment. The Pinnacle Team continues to grow in production each year and are currently one of the Top Producing Teams in the city of Chicago. Click here to being your search with us! "Ryan and his team were a pleasure to work with. They were very supportive of our patient/deliberate search for a new home. Ryan is extremely knowledgeable and thoughtful. He also has an eye for design, layout and value that added a lot to our discussions. The team did a nice job of getting us smoothly through the contract negotiation and closing process. We would recommend them without hesitation."